The Department of Defense has launched more green energy initiatives than any other federal agency and many are duplicative and wasteful, according to a report released Thursday by Sen. Tom Coburn (R., Okla.). The Coburn report details nearly $68 billion in defense spending that appears to have little to do with national defense and instead focuses on issues ranging from beef jerky to studies of flying dinosaurs. Included in the report is $700 million in green energy initiatives. "The Department of Defense launched more than 100 renewable energy-related initiatives in 2010, more than any other federal agency including the Department of Energy," the report says. "Many of these DOD renewable energy projects were so poorly planned, they failed to be cost effective or even produce power, wasting millions of national security dollars." The federal government launched 679 renewable energy initiatives in 2010. 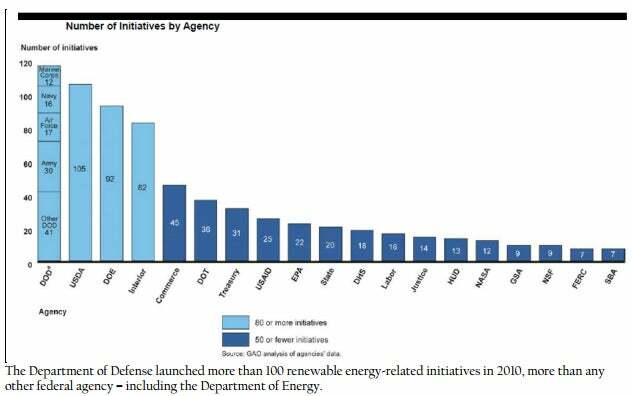 The DoD accounted for 116 initiatives while the DOE started less than 100. The report showcases initiatives it claims were poorly planned and executed. For example, the report notes a $14 million Air Force construction project to convert three Alaskan radar stations from diesel to wind energy. The project was begun without any assurances it was properly planned or would result in any cost savings. The Navy is also spending $170 million to convert parts of its fleet to algae-based biofuel, which currently costs $15 a gallon or four times the cost of conventional fuel. The Defense Department spends more than $15 billion on energy annually and is the largest consumer of energy in the federal government. Alternative fuel could potentially save taxpayers significant amounts of money. "The DoD budget is aligned to strategic priorities we have identified to keep America safe and maintain the strongest military in the world," a Defense Department spokesperson wrote in an email to the Free Beacon. "Over the past several years we have redoubled our efforts to make better use of the taxpayer's defense dollar and meet our fiscal responsibilities." Project On Government Oversight national security investigator Ben Freeman said there is already an agency better equipped to study alternative energy: The Department of Energy. "From a taxpayer’s perspective, I think we’d like to see the DOD reduce fuel costs, but I’m not sure they’re the best ones to investigate that," Freeman said. "The Department of Defense should be forced to explain in detail how these programs should not be primarily funded and administered by the Department of Energy," the Coburn report says. The Coburn report also notes there is no oversight in place to ensure these initiatives are not duplicative. A previous Government Accountability Office (GAO) report found that "there is currently no comprehensive inventory of which federal agencies are implementing renewable energy-related initiatives and the types of initiatives they are implementing. "In light of efforts to balance the federal budget and target spending on activities that will most effectively meet national needs, the lack of available information on agencies’ renewable energy initiatives has further raised congressional concerns about the ability to identify whether efforts are fragmented, duplicative, or operating at cross-purposes," the GAO report said. Freeman said that even close watchers of Pentagon spending might find parts of the Coburn report shocking. "I study the DoD in and out and even I hadn’t heard of some of this stuff," Freeman said. "You just sort of scratch your head and ask why we’re spending money on fish studies and beef jerky."